A good night’s sleep is becoming a luxury these days for many of us. Modern lifestyle, bright screens and above all, noise pollution interfere with our sleep on a daily basis. 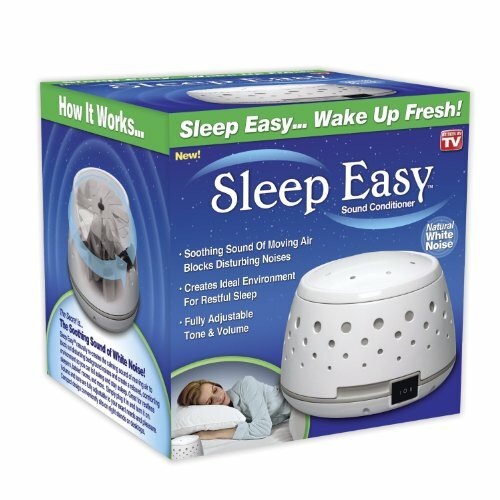 White noise machines are a popular remedy, commonly prescribed for people who have trouble sleeping, either due to mental or environmental issues. These devices produce white noise, which is basically a consistent wave of sound that equally hits all the frequencies that our human ears can hear. But that sounds like a lot of noise, doesn’t it? How can noise help one sleep when it is more often responsible for waking us up? It is quite simple, really. It is not noise per se that wakes us up, it is the sudden variations in background noise, like a car horn, or a dog barking. Our ears work even when we sleep, and if there is a consistent background noise, it will reduce the effects of any abrupt sounds, helping us sleep soundly. And talking about consistent noise, your spouse’s snoring doesn’t help, even if it is consistent, because the noise keeps fluctuating! White noise machines emit soothing muted sounds, like the wind rushing through leaves, or water flowing. Many people find the consistent muted sound emitted by fans to be an excellent sleep aid. That is one example of a white noise. They are excellent at masking any irritating ambient sounds at night like traffic, phones and even your average noisy neighbours. Since they change and influence the ambient sound in your rooms, they are also called sound conditioners. These guys are probably the most experienced brand in the business, having come out with their first white noise machine all the way back in 1962. Often the simplest designs are the most effective and Marpac Dohm seems to exemplify that. Just plug it in, and use the cap and collar to adjust the tone and volume. It emits only one kind of soothing white noise, that of rushing air, like from a fan. You can adjust the noise by increasing or decreasing the speed of the fan and the size of the sound hole openings. It is great for your bedroom, baby nursery, dormitories or even in the office if you want a short power nap. Being lightweight and portable, it is also a great travel companion. 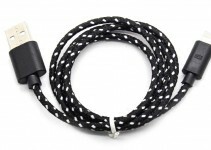 Unlike many other white noise machines, this doesn’t use pre-recorded sounds in loops. So there is no choice in sounds, or a battery feature, or any advanced timer functions. Still it is a very effective and time tested sleeping aid that seems to do the job for a lot of people. Here we have a more modern take on white noise machines. This one is all digital, using pre-recorded sounds that are played back in a loop. There is a fair amount of choice with 6 different soothing sounds on offer. These range from plain white noise, to thunder, ocean, rain, summer night and brook. So if any of those sounds do it for you, this can be great option for all your sleeping troubles. if you find yourself constantly on the road. You have the option to use either a power cord or batteries (4 AAA, not included along with the package). The auto off timer is a very useful function, especially if you are looking at short power naps. At a time when most white noise machines are going digital with fancy play-lists and what -not, this is another device that is a throwback to simpler times. In that regard, it is much like the Marpac, with whom it shares more than a few design and function similarities. I mean, with mechanical sound conditioners like these, there is not much complexity involved. You have a fan that emits the noise, and you adjust the volume by changing the fan speed or changing the size of the sound outlet holes on the device. If the sound of a fan is soothing enough for you, these machines should work fine. But different people have different tolerance thresholds when it comes to noise. That being said, this device does have a lower volume than the Marpac. As to whether that works for somebody is entirely up to personal preference. On the whole, this is an extremely affordable budget device with okay build quality. 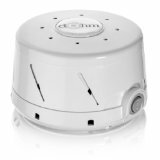 Another digital white noise machine with an interesting oval design. You get 10 different pre-recorded sounds to choose from. All the usual suspects like running water, white noise, ocean waves, forest sounds and bird songs are included. As to whether any of them does the job for you is down to your personal preference. In that way, all these machines are a kind of hit and miss. But the more sound options you have the better your chances are, probably. There is an individual button for each sound, and they are all clearly labeled. You get an auto-timer, but it is restricted to one hour. And yes, you do have the option of using either batteries or a DC power outlet. 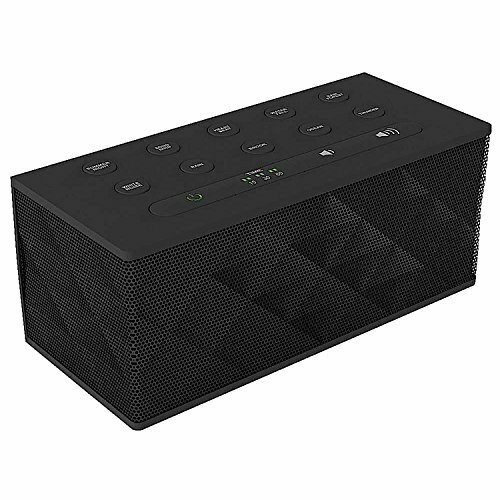 Ditching the popular white and round design for a rather rectangular shape shrouded in all black, this sound conditioner from Palermo does look better than some of the other devices out there. There are two timer setting using two button controls: one for 1 hour use and the second for 2 hours. And you also get 10 different pre-recorded sounds since this is a digital device. This device uses a big knob to select those 10 different sounds. The build quality is pretty decent and the whole design is portable and sleek. And you do get both a DC power cord as well as battery power option (4 AA batteries). 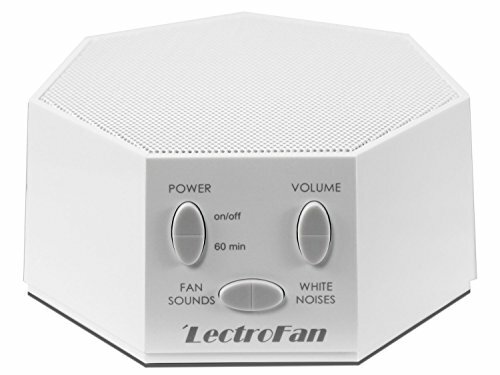 This device stands out from the rest of the competition with its dual functionality: you get ten different kinds of fan sounds 10 different white noise options as well. And those white noise options are not pre-recorded, but generated at different frequencies. So there is a fair bit of advanced tweaking options when compared to other devices, especially those with single fans. If you are into different “flavors” of sounds like ocean waves and running water, this may not be the device for you. But it has more frequency related tweaking options if you are really into tweaking frequencies to suit different ambient sound environments. A rather nice looking black rectangular sound conditioner with the usual play-list of pre-recorded natural sounds. It has very flexible timer functions. You can either leave it on the entire night or use it for short bursts, programmable to 15, 30 or 60 minute durations. 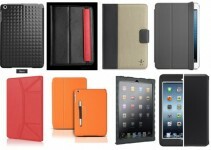 Like the other devices in the list, it is also portable device that is easy to carry around. You can either use an AC adapter or 3 AA batteries. The buttons are all on the top of the device with separate buttons for individual sounds as well as the different timer functions. A sound conditioner dedicated to toddlers, this is purely aimed at parents looking improve the sleep of their babies as well as their own! There are three white noise options specifically designed by the sound experts at the company which boasts of decades of experience in the field of white noise machines. These devices are optimized for babies, with the noises ranging from bright white noise, to deep white noise and gentle surf. The whole design is focused on being toddler safe, with baby proof clips and child lock to prevent the child from accidentally deactivating the device. This a fully portable device with a lithium ion battery and USB charging cord. It can work the whole night on a single charge. There is no AC power cord. This is another device aimed at promoting sleep among babies and toddlers. 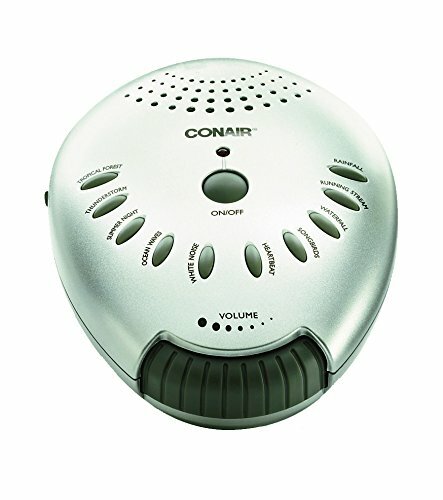 What makes this sound conditioner unique is the fact that in includes both white noise options as well as pre-recorded lullabies. 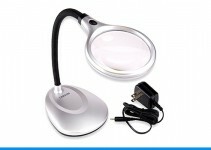 It even includes a projector that can be used to cast soothing images on the walls or ceilings of your baby’s nursery. It comes with 3 white noise options: heartbeat, rain and ocean. You can choose either of the sound options alone or with the projector. The projector comes with 3 picture disks. It also has an auto-timer function for 15, 30, 45 and 60 minutes. 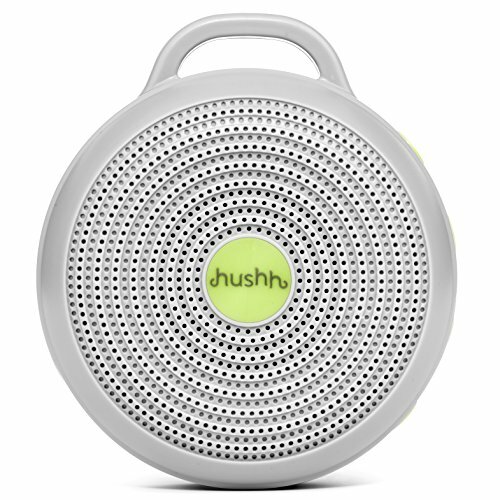 To round off our list of reviews, we have a product that is marketed as a white noise machine for babies, but seems to work equally well for bigger humans as well! 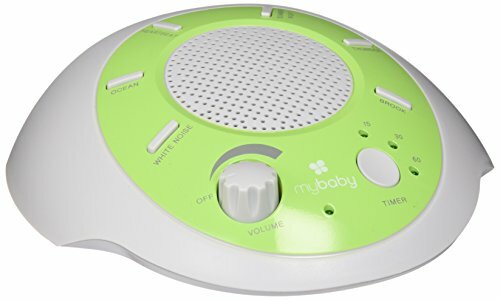 Unlike the other product from myBaby on this list, the Soundspa portable emits only pre-recorded natural sounds like heartbeat, ocean and white noise. You get a choice of 6 sounds to choose from. There are no lullabies or baby friendly projections to worry about. And since white noises that work on babies can work equally well on adults as well, you might as well buy it if you want to sleep like a baby. The simple compact shell like design works well, and it has timer functionality as well. You can either plug it into a AC power outlet or use batteries for added portability.